Forgot your eID or password? The Memorial Books in the Pet Tribute program were started in 1986. The database of entries is accessible from 1991 forward. The books are available for public viewing at Trotter Hall on the Kansas State University campus during normal business hours, 8:00 a.m. to 5:00 p.m, Monday through Friday. You can search the database for individual entries by clicking here. To request a hard copy of a specific page from one of the Memorial Books, please contact the Pet Tribute program at 785-532-4013 or complete the form below. 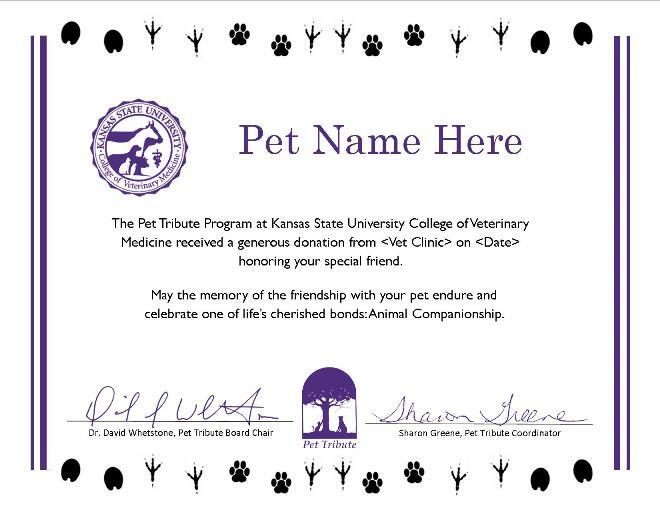 You may also choose to receive a customised pet tribute certificate by checking the "Hard copy of Pet Tribute Certificate" box. Please use commas to separate multiple animal companion names in the textbox above.